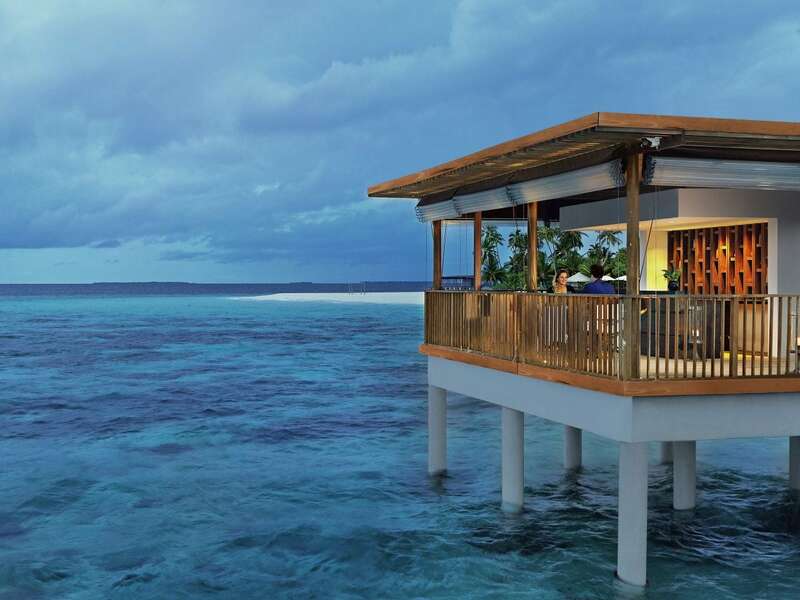 This contemporary à la carte dining restaurant serves breakfast, lunch and dinner featuring a range of international cuisine for unique dining experiences in Maldives. 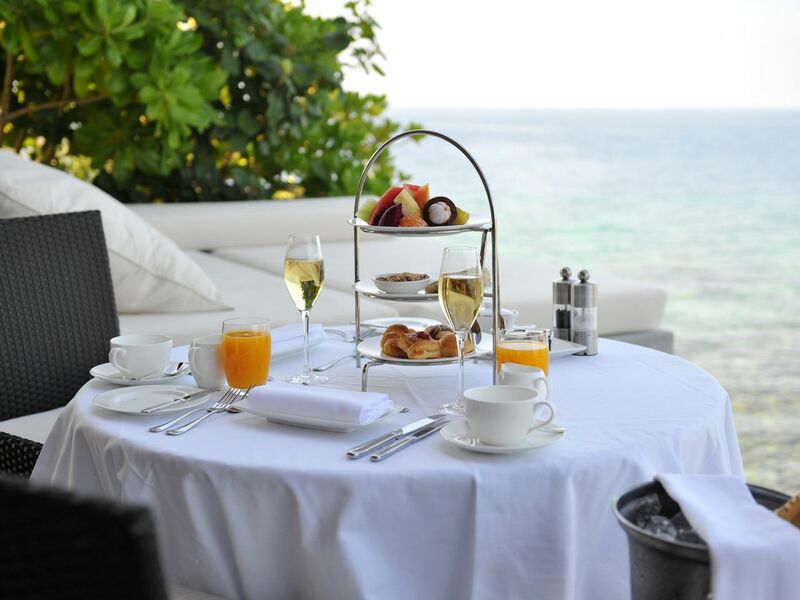 The Dining Room is situated next to the infinity pool with views of the ocean. An extensive list of fine wines is also available for your dining pleasure. A traditional grill combined with a wood fired oven complements the open kitchen décor where guests can watch chefs at work. 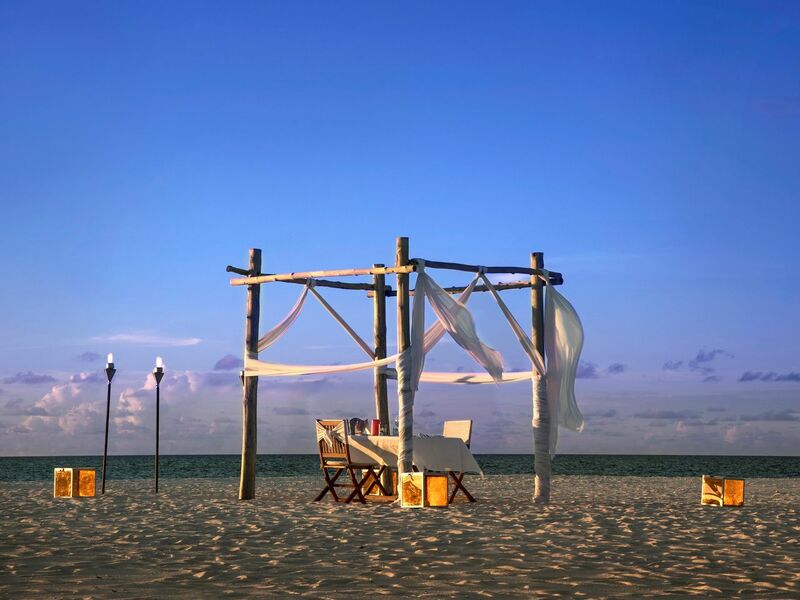 Tables and swing chairs are set on a blanket of fine white sand. Slip your feet into the sand while enjoying freshly grilled seafood or prime cuts of meat, an ideal barefoot luxury moment for a heartwarming dining experience. 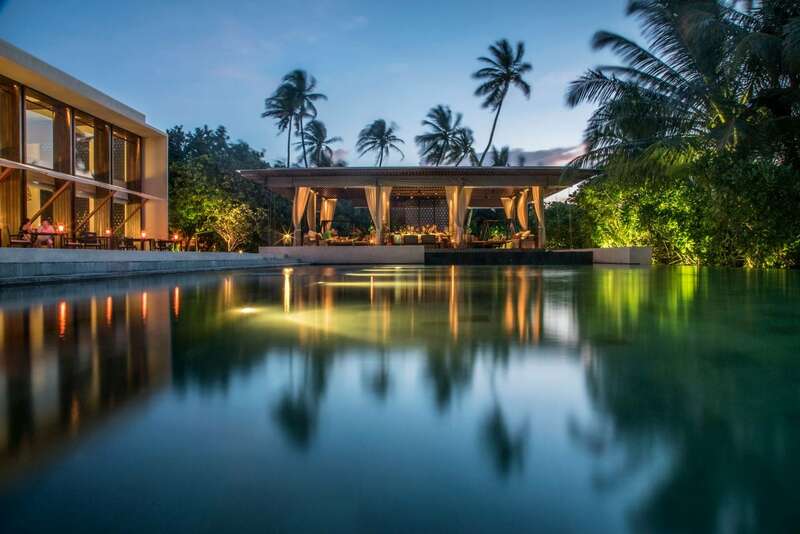 Saturday to Thursday 7:00–10:30 p.m.
Perched directly over the lagoon overlooking the Indian Ocean horizon, The Drift is a dining experience redefined with an exclusive seating. Set your palates adrift with cuisines from Italy, China and Thailand. Discover your unique journey of flavors today. With views of the resort, pool and beach, our bar in Maldives offers a broad selection of signature refreshments from around the globe. Enjoy a refreshing drink throughout the day along with small bites from the bar snack menu. 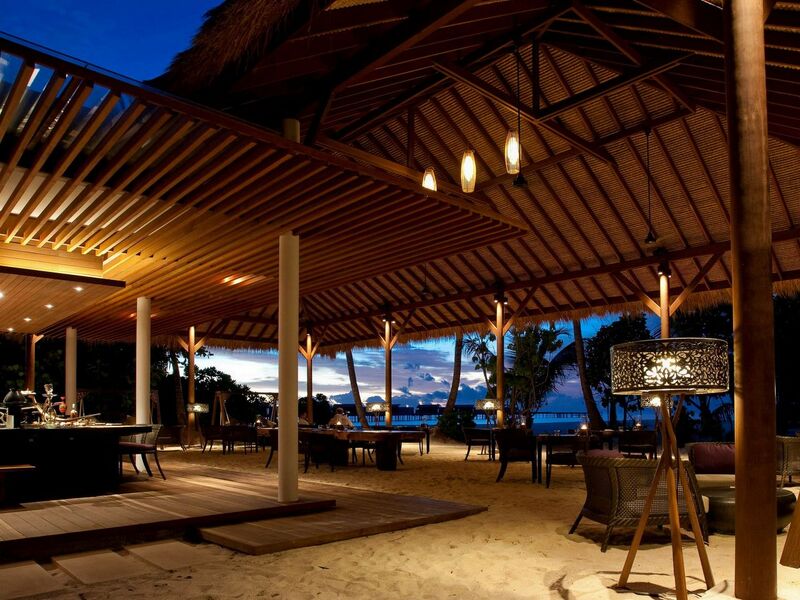 Relax in one of the beach cabanas underneath star-studded skies or whilst watching a spectacular Maldivian sunset. 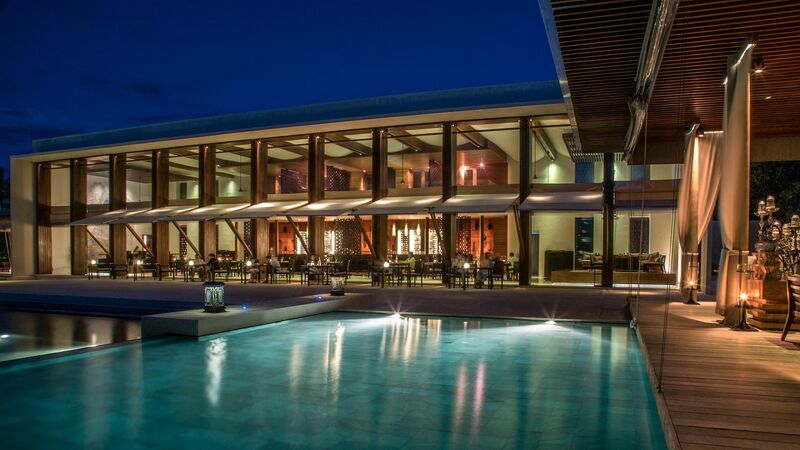 This traditional yet contemporary lounge area is a true architectural masterpiece for Maldives resorts. 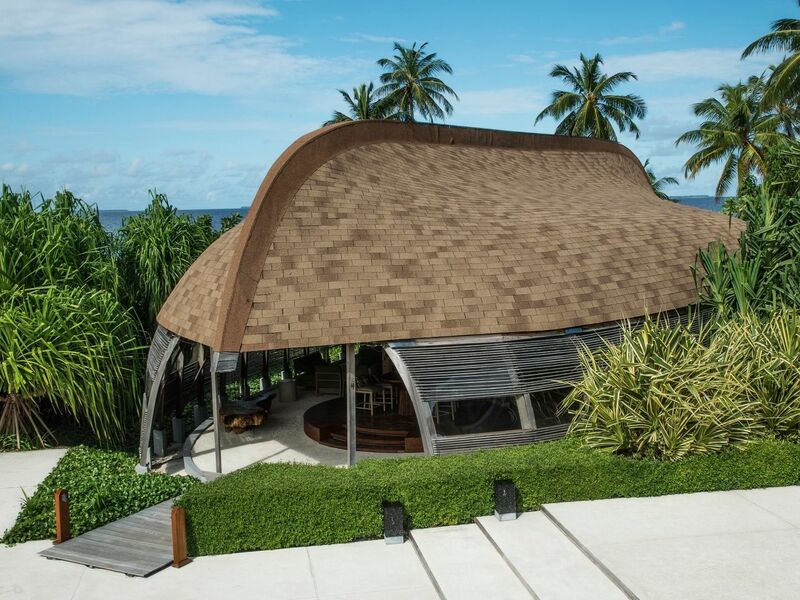 Built by local dhoni (fishing boat) builders, the design of the roof sheltering this cultural structure is an enormous upturned dhoni making it an impressive visual feature greeting guests as they arrive on the island. Select from a list of unique and romantic dining venues and enjoy one of the best Maldives dining experiences with your loved one. Each private dining theme is inspired by the environment and surroundings. Among the popular private dining options available include Hadahaa’s Culinary Indulgence, blind dining in Maldives and sunset beach dining. Serving an extensive all-day menu from both The Dining Room and The Island Grill, our in-villa dining service caters on request. 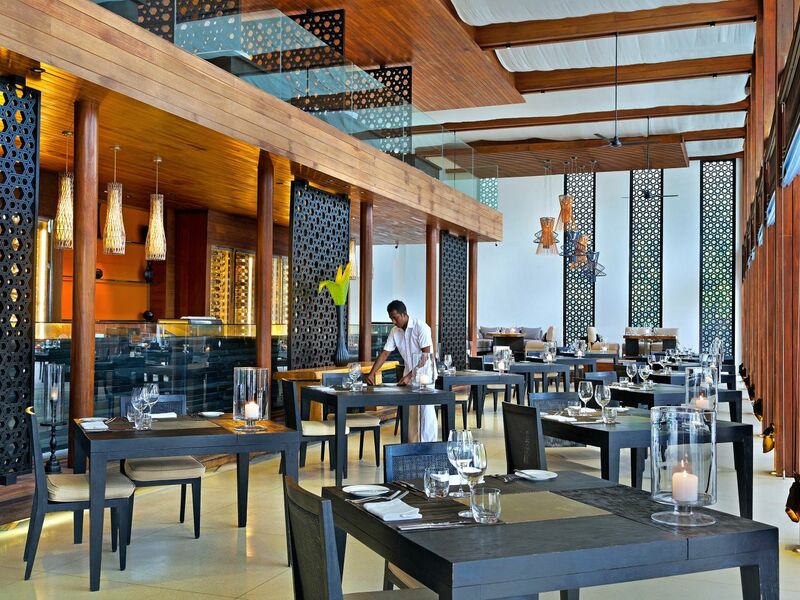 Available 24-hours a day, your Maldives dining experience can be enjoyed in the privacy and comforts of your villa. Half Board includes daily breakfast, 3 course a la carte dinner at The Dining Room, excluding Chef’s Specials. A 50% discount off published price on any Chef's Specials items is applicable for any exchange of a 3 course item for a Chef's Special dish. Orders of any additional Chef's Specials dish would be charged at published price. All drinks are chargeable. US$ 75 credit per adult and US$ 30 credit per child will apply if guests on HB supplement will dine at The Island Grill for dinner. Full Board includes daily breakfast, 2 course a la carte lunch and 3 course a la carte dinner at The Dining Room, excluding Chef’s Specials. A 50% discount off published price on any Chef's Specials items is applicable for any exchange of a 3 course item for a Chef's Special dish. Orders of any additional Chef's Specials dish would be charged at published price. All drinks are chargeable. US$ 75 credit per adult and US$ 30 credit per child will apply if guests on FB supplement will dine at The Island Grill for dinner. Premium All Inclusive includes a selection of premium brand spirits & liqueurs, beers and house wines in both restaurants and the bar. 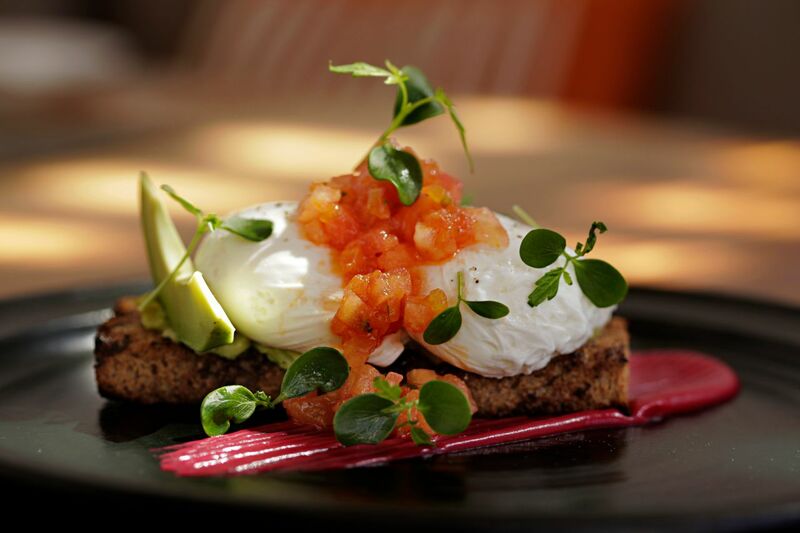 The Dining Room – daily breakfast, 2-course a la carte lunch and 3-course a la carte dinner, excluding Chefs Specials. A 50% discount off published price on any Chef's Specials items is applicable for any exchange of a 3 course item for a Chef's Special dish. Orders of any additional Chef's Specials dish would be charged at published price. The Island Grill – dinner only. Complimentary inclusion for BBQ Night. Includes one private beach dinner to be available on the evening of guest’s choice during stay. A 24 hour notice for reservations is required. Alternative options will be offered if beach dinner will not be available due to weather conditions. *Selected meal plan will be applied throughout the stay. Guests will not be refunded for any unconsumed meals. All meal supplements stated have to be booked in advance upon confirmation of the accommodation booking. *Meal plan rates stated are valid for stays from 24 December 2018 to 19 December 2019. Please contact us for information. *Meal plan rates are inclusive of all taxes and service charge. *Meal plan benefits listed above are applicable for bookings made directly to the hotel only. For other meal plans booked through different channels, entitlements will vary. *Meal plan rates are applicable for any hotel published rate and World of Hyatt redemption nights by Globalist members.